Physicists are on the hunt for elusive dark matter, the hypothesized but as yet unidentified stuff that makes up a large majority of the matter in the universe. They had long favored “weakly interacting massive particles,” known as WIMPs, as the most likely dark matter candidate, but after an exhaustive search, some scientists are moving on to more exotic particles. Most estimates suggest that there’s 5-6 times as much dark matter as there are things that we can see, such as galaxies, stars, and planets. Yet physicists know very little about what the mysterious dark matter particles actually are, as they cannot be directly observed and barely interact with normal matter. New research leaves dwindling room for WIMPs, motivating a search for other particles that could fit the bill. Zurek and others presented ongoing work on dark matter alternatives to WIMPs in April at an American Physical Society meeting in Salt Lake City. “We should broaden the searchlight, and the natural place is to go lighter,” Zurek said. She and her colleagues are looking into less massive particles that interact more weakly with ordinary matter. These include an array of particles with exotic names like “axion,” “sterile neutrino,” and “Higgsino,” a theoretical super-partner of the famous Higgs boson. Axions are hypothetically abundant particles originally proposed in the 1970s to solve a problem with nuclear physics. In the presence of a powerful magnetic field, these minuscule particles, which are lighter than electrons, are predicted to turn into detectable photons. In spite of years of searching, however, they have yet to be found. But the Axion Dark Matter eXperiment, currently being upgraded, should definitely determine whether the particle exists, said Leslie Rosenberg of the University of Washington in Seattle. Kevork Abazajian, a cosmologist at the University of California, Irvine, sees a new trend in the field over the past decade. 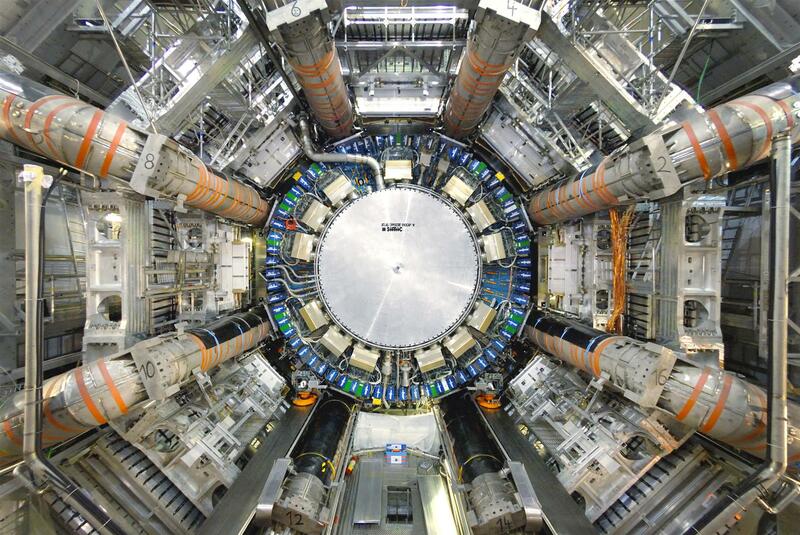 “The new generation of early-career physicists is more open to dark matter other than WIMPs,” he said. The universe is teeming with galaxies, but gravity distorts our view of them. Astrophysicists with the ongoing Dark Energy Survey have now collected giant catalogs of the distorted shapes of 24 million distant galaxies, making it possible to probe the underlying structure of the rapidly expanding universe. Dark Energy Survey scientists investigated the “cosmic web” of galaxies at least as big as the Milky Way — as well as the surrounding hidden clumps of dark matter. They presented their research findings on April 17 at a meeting of the American Physical Society in Salt Lake City. Dark matter cannot be seen directly, but just as an animal can infer the existence of a predator upon seeing its shadow, astrophysicists infer the distribution of dark matter by detecting its gravitational effects. 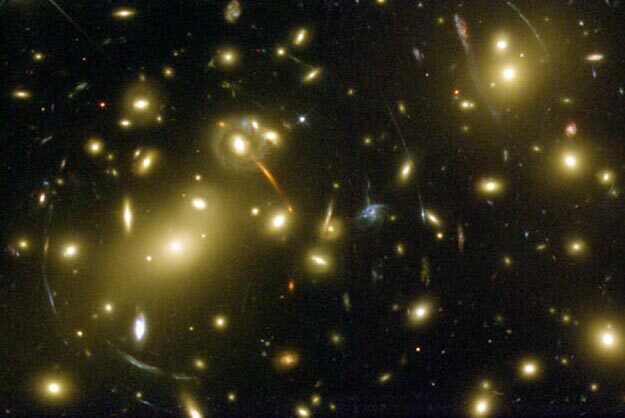 According to Einstein’s relativity theory, a massive object can warp the fabric of space-time, bending the light rays emanating from background galaxies and magnifying and stretching their images around them. There is between five and six times as much dark matter as regular matter, which includes galaxies, stars, nebulae and planets. But, a web of dark matter clumps fills the universe, implying that the “cosmic lenses” it creates can be found in every direction if you look deep enough. The lensing effects are extremely tiny, but collect enough images and scientists can run statistical studies on them. Astronomers from the survey have done just that. They sifted through millions of gigabytes of data and produced a preliminary map of the locations of 24 million galaxies, indicating which regions are densely packed with galaxies, each containing hundreds of billions of stars. “I can’t describe how amazing this map is,” said Michael Troxel, an astrophysicist at the University of Manchester, in the U.K. and member of the collaboration. Troxel and his colleagues are now at work using this detailed map of distorted galaxies to reconstruct the universe’s dark matter scaffolding. In the process, they plan to construct the largest map of the dark matter distribution ever made. They aim to complete the project by the end of 2016. How Do Giant, Super-Earth Planets Form? Our early solar system might have formed a giant terrestrial, rocky planet that dwarfed Earth and its neighbors. But if it did, gravity likely pulled that planet into the sun, where it burned up long ago, researchers said. Such massive planets, called “super-Earths,” can be up to ten times as big as our world. They seem to be ubiquitous in the Milky Way, but our solar system is “somewhat special” in that it doesn’t have a single one, said Rebecca Martin, an astrophysicist at the University of Nevada, Las Vegas. The smallest planet bigger than Earth is Neptune, and it’s a gas giant. In a new study, Martin and her colleague Mario Livio sought to understand how the solar system could have a dearth of super-Earths. They modeled the processes through which these massive worlds assemble in planetary systems. They examined two ways that they could form, either close to or far from the stars they orbit, by slowly accumulating material over millions of years from clouds of gas and clusters of rock spiraling around. They are publishing their findings in an upcoming issue of the Astrophysical Journal. A majority of the thousands of planetary systems detected so far host super-Earths. But with NASA’s Kepler spacecraft and other telescopes, astronomers struggle to identify smaller planets, which are minuscule compared to their stars. As a result, it’s not clear whether Earth-size planets are even more common than their bigger cousins. “The jury’s still out on that,” said Ian Crossfield, a planetary astronomer at the University of Arizona who was not involved in the study. 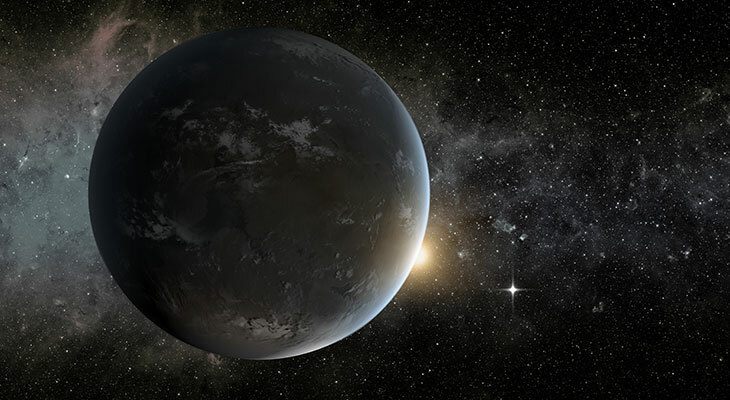 Most super-Earths are found in close proximity to their host stars. Many systems appear to have one or even two planets closer than Mercury is to our sun, though this could be due to ‘a bias in detection techniques toward finding more close-in planets. In the 19th century, astronomers once thought that our inner solar system might be more crowded, and they hypothesized the existence of a planet they dubbed “Vulcan.” But the hypothesis was based on a misunderstanding of Mercury’s orbit, and the mysterious planet was never found. Martin and Livio developed computer simulations to investigate the evolution of planetary systems. First, giant clouds of gas and dust, hundreds of light-years across, begin to coalesce and form new stars. Then, gas and rocky debris rotate rapidly, turning into a proto-planetary disk. ← Space mining is becoming a reality. But is it legal?